Friends, carb lovers, and soup enthusiasts, lend me your… eyes? Okay, not too sure where I was going with that one. Maybe it’s the carbs talking? All I can presently think about is the way that roasted garlic smells when it’s mingling with rosemary and good olive oil. My heart does a little summersault as the focaccia bread bakes away unleashing the most delightful aroma. Then when you pull it out of the oven, you can hear just the faintest sizzle of the olive oil as it gently bubbles and kisses the outer crust until it’s golden brown. You use a serrated knife to slice into a hunk and notice how light the bread is. Tender and fluffy on the inside, golden and flaked with sea salt on the outside. As you tear off that first piece, you see the swirls of steam escaping. The edges are crispy, chewy and the inside is buttery and delicate. I’ll be the first one to tell you, for a while I found bread making to be tedious and slightly, okay, let’s be honest, SUPER stressful. As I get older, I realize tasks like breadmaking are so calming. There’s something so relaxing about putting a few ingredients together and making something entirely from scratch. Flour, water, yeast, and salt. It’s almost magical when these ingredients get together in a bowl. I love how the act of bread making allows you just to unplug from the world, roll up your sleeves, and get into the zone. Early morning baking with a little smooth jazz on in the background and a warm mug of coffee is how I’d choose to spend every day if it were up to me. Homemade focaccia makes me fall in love with food all over again. Focaccia bread, you’ve had it before, right? It’s thick and a little chewy. I hear people comparing it to pizza dough quite a bit, but to be honest, I’ve never had pizza dough that was soft and chewy like this focaccia bread. Typically it’s made with freshly chopped herbs, flour, and quite a few glugs of olive oil. 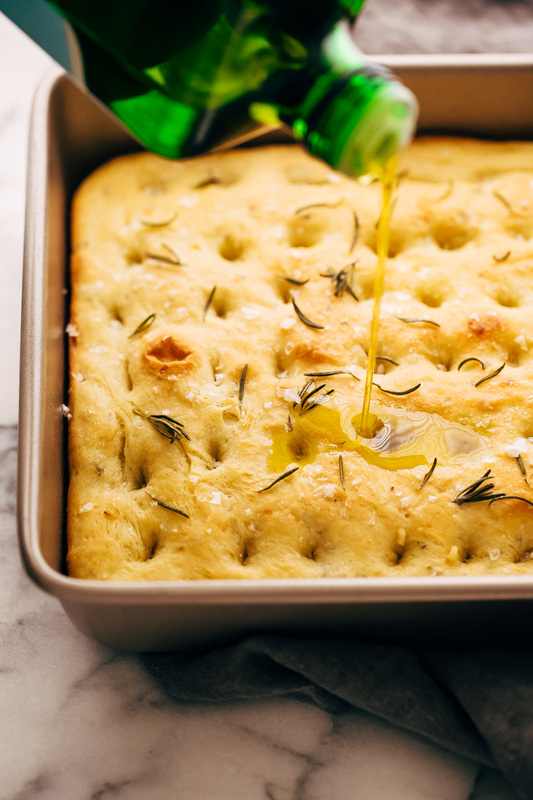 The olive oil is what gives focaccia bread it’s decadent flavor. 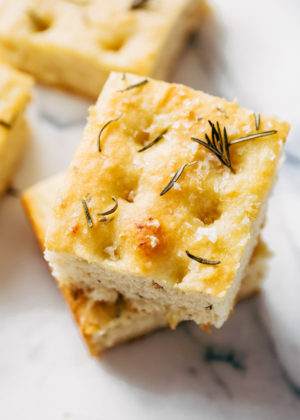 And though I’ve only ever dreamt of having authentic Italian focaccia, I imagine every nonna teaching her granddaughter to add copious amounts of olive oil until it’s luscious and buttery just like all the nonnas before her made it. 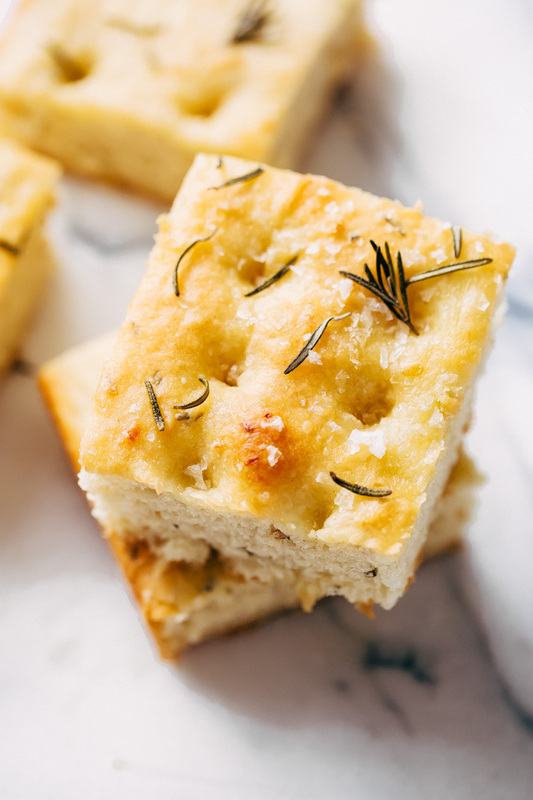 Like traditional focaccia, today’s rosemary focaccia bread recipe has tons of rosemary in it. 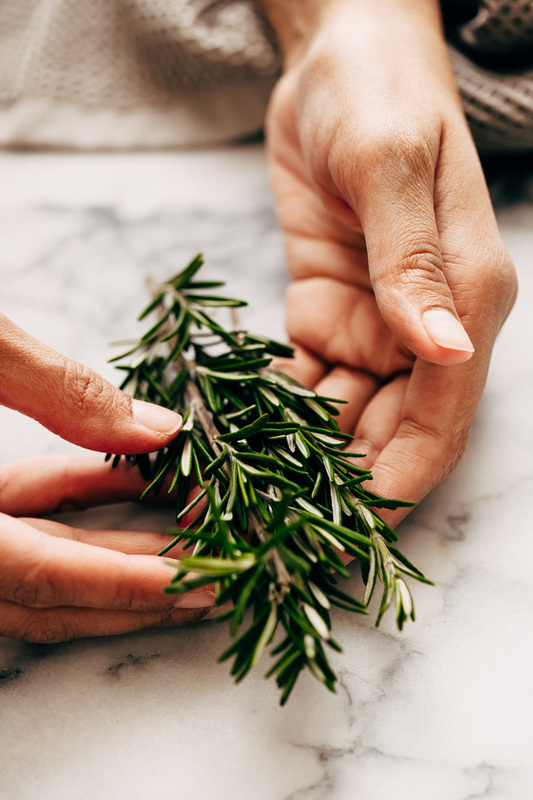 Usually, I err on the side of caution when it comes to rosemary because personally, I find it can go from adding earthy flavor to tasting like hand soap rather quickly. Maybe that’s just me. 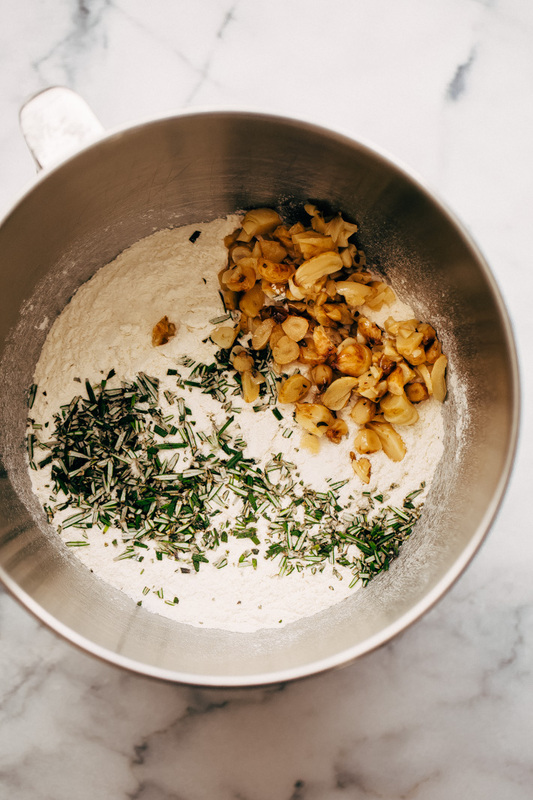 But even though we’re using a full tablespoon in today’s bread dough and then topping it with more rosemary, I have yet to make a batch that teetered on the verge of too much. I wanted to make this recipe easy to make for everyone while keeping it to a small(ish) batch. 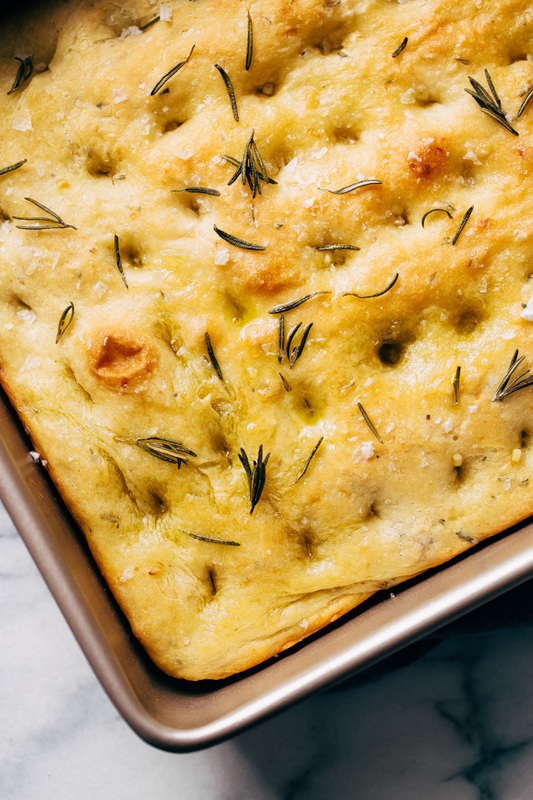 We’re using a 9×13 baking pan to bake today’s focaccia as this is a size that’s most commonly found in most kitchens. You might know it as your brownie baking pan. Once you make focaccia bread, you may need to rename it. If you’ve got a glass dish, that will work too. Just be sure to oil it well before using. Yeast: This recipe requires fresh yeast. I usually buy a bottle of yeast from the store and keep it refrigerated. If you’re doing the same, you’ll need 2 1/4 teaspoons in total. If you’ve got the kind in a packet, you’ll need one pack. Make sure you use water that is lukewarm (or more specifically, 105-110ºF). You can test this using a thermometer (affiliate link) or just by sticking a finger in the water and checking to make sure it’s warm to the touch. Olive oil: we’re using a generous 1/2 cup, and I know that does sound like a lot of oil but trust me, this recipe needs it. And not only that, you’ll also brush a little more on when the bread comes out of the oven and you what? 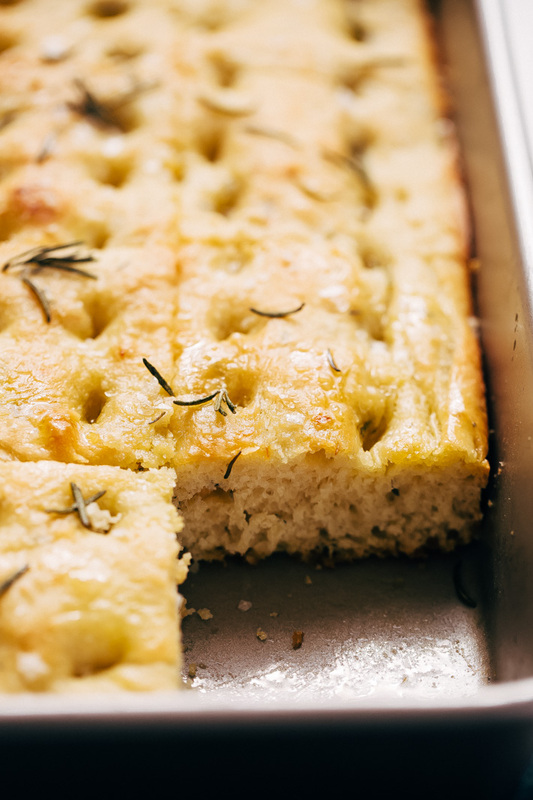 This is a sometimes recipe, so sometimes, it’s okay to have olive oil soaked focaccia bread. The olive oil is divided into 2 parts, 1/4 cup goes into the bread itself, the rest is split (2 tablespoons each) go to greasing the pan. The last two for brushing on top before the bread goes in the oven. Roasted garlic: you guys already know we’re huge fans. I usually roast my own garlic accept when I’m in a huge hurry. So if you’d like, you can roast your own garlic at 375ºF for 1 hour. You would just chop off the tip of the garlic and peel off as much of the paper as possible. Then, drizzle with a couple teaspoons of olive oil and sprinkle with salt and pepper. Wrap it up in foil and pop it in the oven and sit back as it makes your whole house smell like Thanksgiving. Roasted garlic is also sold in the deli section of most grocery stores (by the pound). You don’t need a whole lot, so that may be an option for you as well. If you’re not a fan of garlic, roughly chopped olives (green or kalamata) would be a great addition here. If you’re purists, just leave it out altogether. 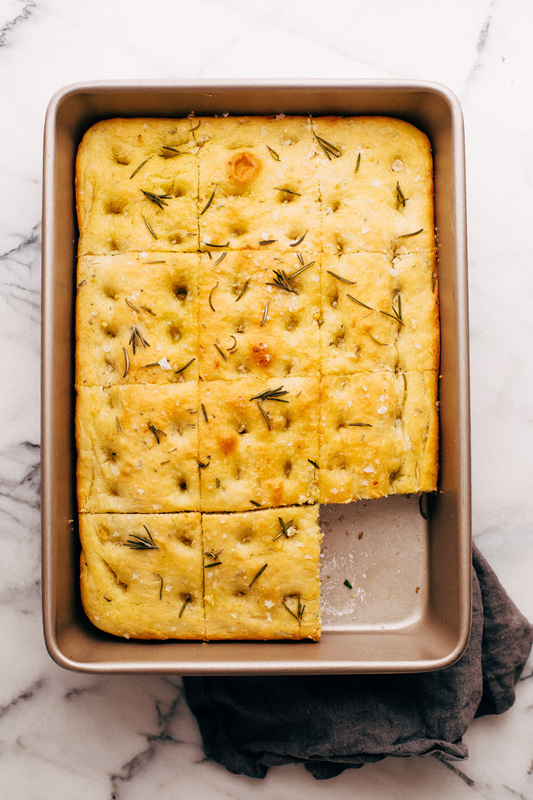 Good rosemary focaccia bread is everything. The perfect companion to a bowl of soup, the Robin to your Batman when you need to mop clean homemade ragu , and the perfect base when you’re building a hearty eggplant parmigiana sandwich. Seriously, everyone I shared this focaccia bread with, starting with Anees, family, and friends, has LOVED it. Bread has a way of bringing people together at the table, so I urge you to share this little number with all those you love! Add the warm water, sugar, and yeast to a 2-cup measuring cup  (affiliate link). 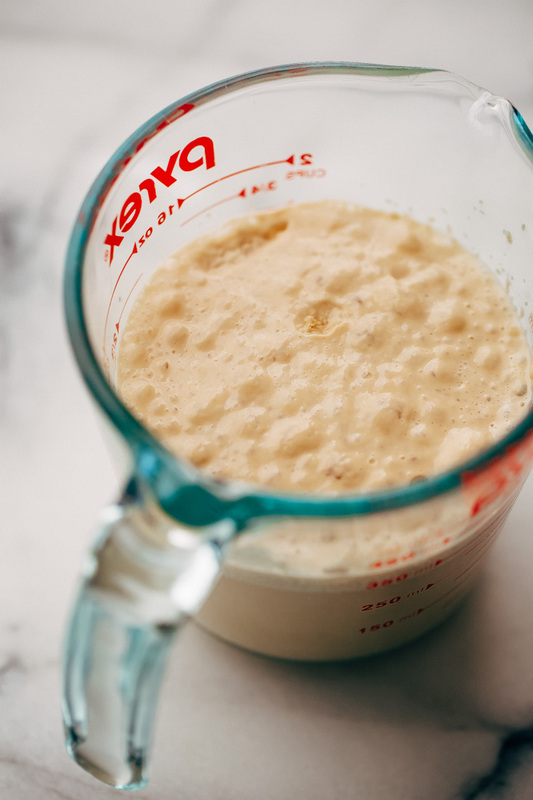 Give it a stir and allow the yeast to bloom for 15 minutes. You’ll see the yeast is foamy and bubbly near the end of the 15 minutes. Position a rack in the center of the oven and preheat the oven to 400ºF. Using half of the remaining olive oil (2 tbsp), grease the bottom of a 9×13 dish  (affiliate link). Remove the plastic wrap, and dump the dough into the prepared dish. Gently, using your fingers, push the dough out so that it fits the pan. Cover the dough with the plastic wrap and let sit for 20 minutes. Brush the remaining 2 tablespoons of olive oil onto the dough. Using your fingers poke holes in the surface of the dough (seriously, poke all the way to the pan!) Sprinkle with additional rosemary, if desired and flaked sea salt  (affiliate link). Bake the bread for 20-25 minutes or until golden brown on top and cooked all the way through. Remove from the oven, drizzle or brush with a little bit more olive oil and let cool for a few minutes before slicing and serving! You can use all AP flour for this recipe or what I find yields slightly better results is using 1 1/4 cup bread flour with 2 1/2 cups of all-purpose flour. I suggest using the ‘spoon and level’ method when measuring out the flour. Here’s  a video that shows you how to do that! If you have a hand mixer with dough hook attachment, that will work just fine for this recipe. You can also use a bread dough machine to combine the dough or even just knead the dough with your own hands (about 12-14 minutes).